When you have a flat roof water pool for extended periods of time, it could have negative results to the membrane and structure. These areas that pool also accumulates dirt and leaves that accelerate the growth of algae and moss which is also harmful to the roof. Watch videos on how the best flat roof drain system to prevent standing or pooling water on a flat roof. It is not considered standing water if it evaporates or dissipates within 48 hours. If pooling water does not drain or disappear within 48 hours, it will cause severe damage to the structure over time. It starts with the weight. Standing water weighs approximately 5 lbs. Per inch for every square foot. If the pooling water covers a 10 x 10 feet area, and it is deeper than 1″, then the added weight of this area is approximately 500lbs. This weight will put stress on the joists or beams causing them to bow. The continued pressure will sag the roof more, and a larger amount of water pool will form. 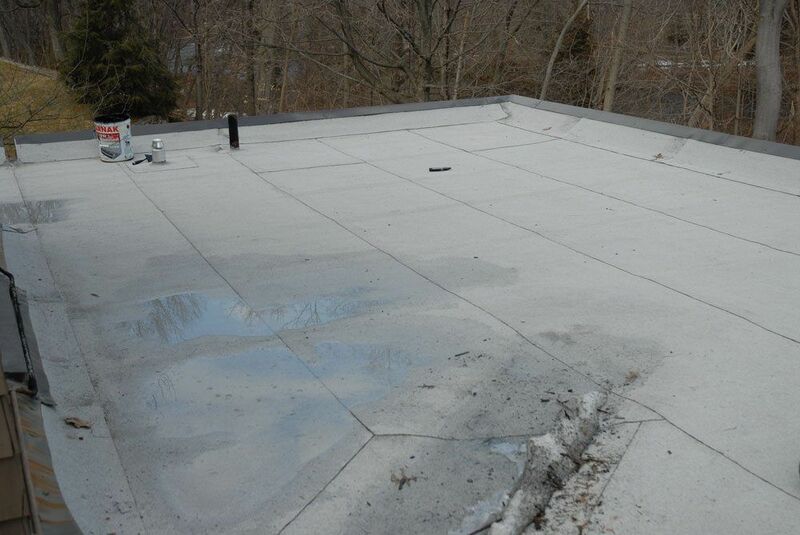 This added stress to the roofing membrane will cause the seams and flashing to pop loose. It is not possible to reverse the bow in the joists after subjected to that pressure. When plants start to grow from a drain that is blocked, then there is a problem. 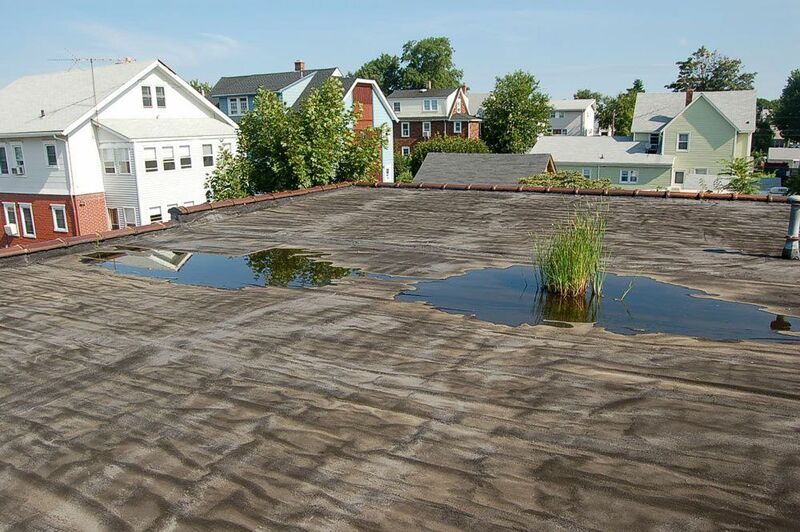 Every time it rains hard enough this roof builds up a big pool of water that causes pressure on the structure and in turn the roofing membrane. Notice how the roofing membrane is not laying flat. This entire flat roof has been compromised. This roof could have been saved if they kept the flat roof drains open and free from debris. There are times where water is pooling on a roof with skylights and drain pipes sitting in the water. Most contractors will suggest building the low area up so water would not pool. This could be very expensive because skylights will have to be removed and then be re-installed again. Instead, we decided to install a channel leading the water away. This is a much simpler solution when possible. It is important that the roofing contractor you hire plans the roof installation so that there would be no standing water. We have seen so many times that they would install a roof disregarding the position of the drain or scuppers. An architect might have laid out a plan and positioning of drains, but it’s up to the roof technician to make sure the water flow properly to the drains. 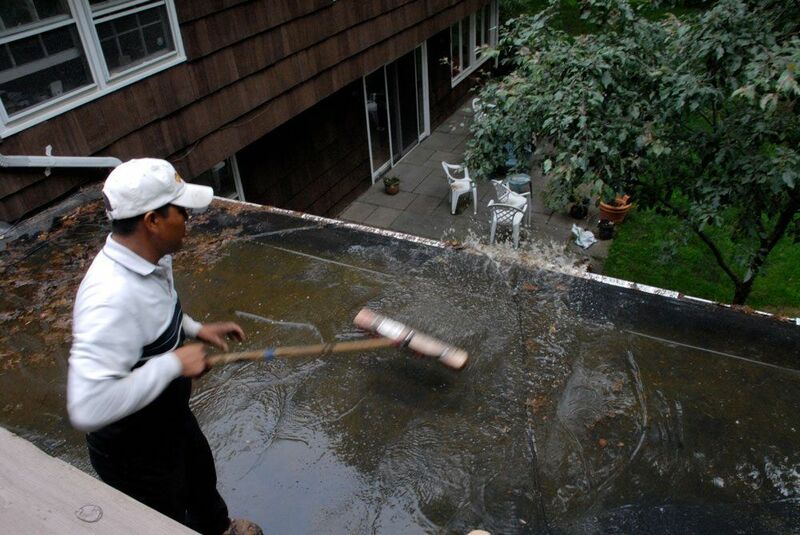 There is nothing worse than having a new roof and water pooling because of bad planning. In the next video, that is exactly what happened, the roofer was not experienced and caused water to pool in areas that caused structural damage. The weight of the water pooling on a roof can cause the joists to bow and in turn, cause more water to accumulate. It is is very important to correct this issue before it becomes irreversible and costly repair follows. Improving a flat roof drain system on a flat roof will extend the life expectancy and less maintenance over the years needed. This image was taken shortly after it rained and snowed. Notice the little water left on the roof. 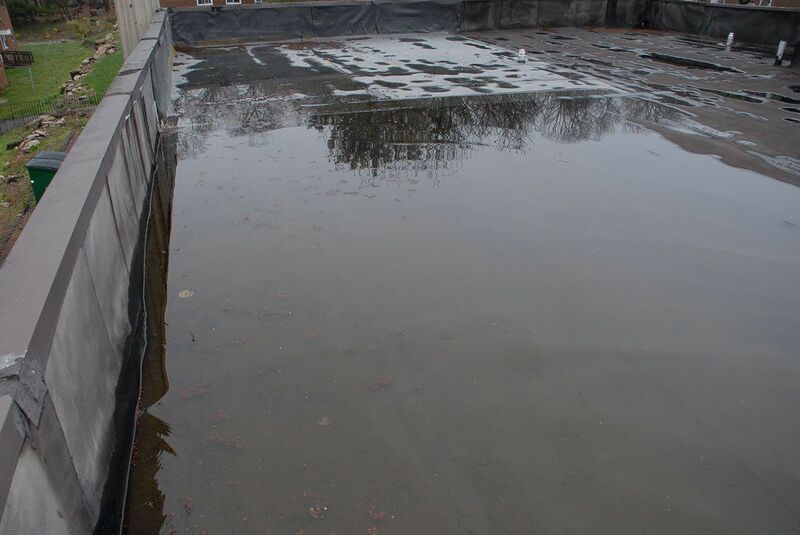 When standing water can evaporate or dissipate within 48 hours, then it’s not considered pooling water on a flat roof. The scuppers on this flat roof are the best drainage system. Although a small roof, the roof was not pitched towards the gutters causing the water to pool against the flashing on the wall. Because EPDM Rubber uses an adhesive to bond the seams together, the prolonged water saturation caused the adhesives to deteriorate and all the seams starting to separate. Sometimes it is feasible to install a drain at the lowest part of standing water. This will entail cutting the roof open, installing necessary supports for the drain, and installing necessary pipes inside the building to lead water to the outside away from the building. This method is much more costly than the above-suggested method with a channel. A drain might be the only answer to the problem if the edge of the roof is too far for a channel or the slope of the roof is not favorable. If installing a drain is the best choice of removing pooling water, then we recommend following the principle in the 3D animated video. When the opportunity lends itself, then always opt in for a drain as illustrated in the video. you, you’ve hit the nail on the head. The problem is something not enough people are speaking intelligently about. I’m very happy I found this during my search for something regarding this. Thanks for the nice words. I am always working on it trying to improve it. Hopefully, more people will benefit from this flat roof repair site. There are enough homeowners that would like to know how to fix their own roof.